When it comes to 3D printing extruders there are many variants but basically two different types: direct drive and bowden extruders. My 3D printer, an Original Prusa i3 MK2S comes with a direct extruder and shows superb printing quality. But just for fun and the sake of getting familiar with bowden extruders I designed a new extruder from scratch. Besides the extruder the hot end carriage also needs to be replaced. Thankfully the Prusa printer parts are open source and I could easily modify the original part. A complete disassembly of the X-carriage is unfortunately necessary. 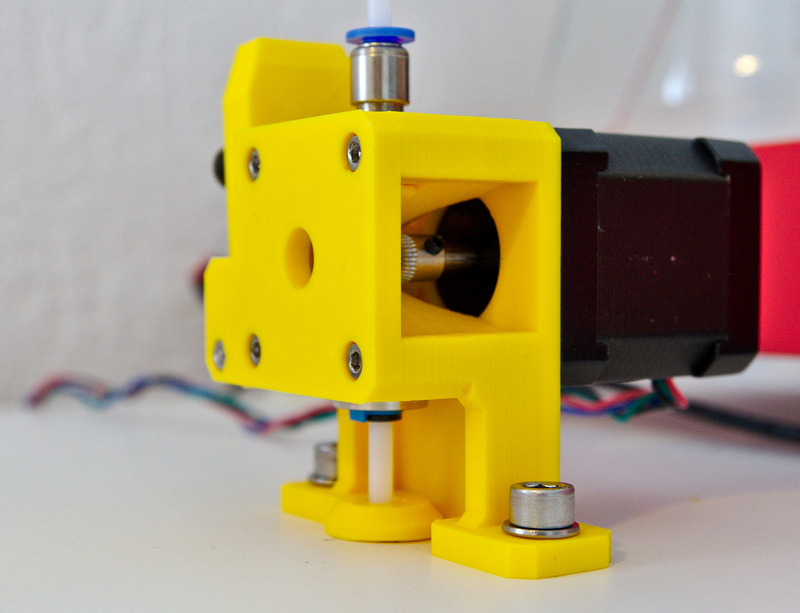 The finished extruder is shown below. The printed parts are available for download at the bottom or on Thingiverse. Next step: calibration and testing. It is, as always, quite a tedious process modifying and fine-tuning the right settings. But eventually I got there and get some nice prints with this new setup. Both types of extruders have different advantages and disadvantages due to their specific geometry. The difference stems mostly from the fact that the filament used in 3D printers is quite elastic when pushed hard enough through the hot end’s nozzle. In a direct extruder setup the motor is located as close as possible to the hot end so there’s only very little filament between the drive gear and nozzle. It allows very direct control over the filament flow and retraction, the material’s elasticity does not play a very critical role. This extruder is therefore the best choice for printing flexible materials. However, with the extruder mounted so close to the hot end the X or Y axis motor needs to move this additional weight, too. This somewhat limits the speed and acceleration the extruder assembly can be driven at. In a bowden setup the extruder is spatially separated from the hot end and typically connected with a teflon tube. The filament is guided by this tube which has an inner diameter only slightly larger than the filament. This makes the hot end assembly lighter and can potentially result in higher movement speeds. But now there’s a quite long filament string (about 30 – 50 cm) that the extruder has to push. Its elasticity is much more pronounced than in the direct drive setup and leads to several issues, such as increased oozing. The play inside the teflon tube and the filament’s compressibility cause an additional hysteresis before the molten material exits the nozzle. Both can be compensated for with advanced numerical algorithms such as Linear Advance (available in Marlin). Extruder calibration and such is pretty straightforward and not much of a hazzle. Unfortunately the compensation for the bowden’s intricacies, oozing, corner blobs, hysteresis, etc. are not so straight forward. For example I had to crank up the linear advance factor to extremely high values (30 times the value of a direct drive system). It does work but introduces high accelerations on the stepper motor leading to an increased noise level or even missed steps. The only solution to this is printing at reduced speeds, which kind of defeats the whole purpose. The initial idea, a lighter extruder and therefore higher speeds, turns out to be more of an idealized, theoretical benefit. Unless you can accept a significantly reduced print quality the compensations required to overcome the “bowden effects” realistically lead to slower printing speeds. If you want higher printing speeds you’re much better off with using larger motors.